Christmas Decor Exclusive Offer - SeaScape, Inc.
Christmas carols have already started playing on some radio stations and stores are stocked with wrapping paper. Christmas Décor by SeaScape can take the hassle out of making your home look like a winter wonderland. From classic white roof lines to multi-colored trees, Christmas Décor can provide all manner of outdoor decorations to our RI and SE MA customers. Our trained decorators will come and install your outside décor for you. When you are ready to have your decorations and lights removed, we’ll return to store them for next season. 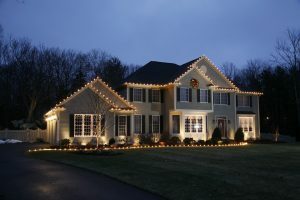 No more tangled lights and hastily installed wreaths; no more climbing on ladders and worrying about timers and cords. Christmas Décor by SeaScape can provide you with beautiful and worry free outdoor décor, leaving you more time to enjoy your holidays. As a special “thank you” for being loyal SeaScape customers, we are offering $100 off all new Christmas Décor packages* for 2017. Please just mention the offer when you call for your free consultation! Please call our office at 1-800-294-5296 or send an email to email@seascapeinc.com to book your no obligation consultation now. *For SeaScape customers only. Minimum order required. Cannot be combined with any other discounts or offers.